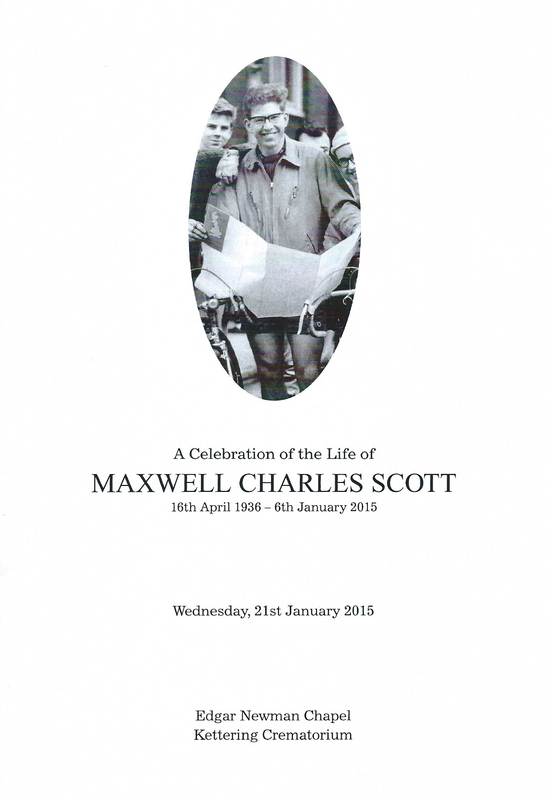 Today we said farewell to Max Scott – Mr Cycle Tourist. Here is the cover of, and some photographs from, the Order of Service. There are some other photographs of Max in an earlier post. 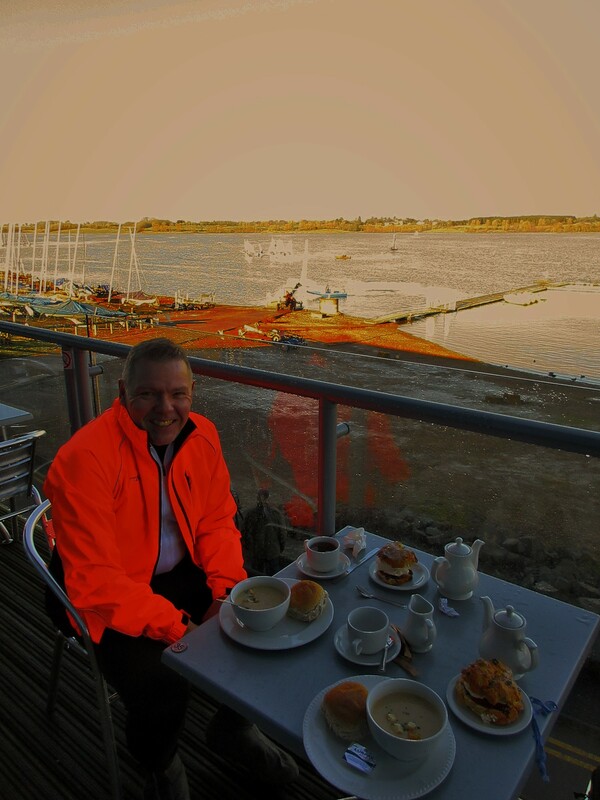 Just three riders decided to brave the biting cold on this day ride to Draycote Water which looked promising initially as the sun was shining early on. We plummeted down into the valley and the temperatures followed as the sun went behind gloomy skies. We spun across Pineham’s smooth cycle paths, aware of the ground frost on the excellent surfaces. 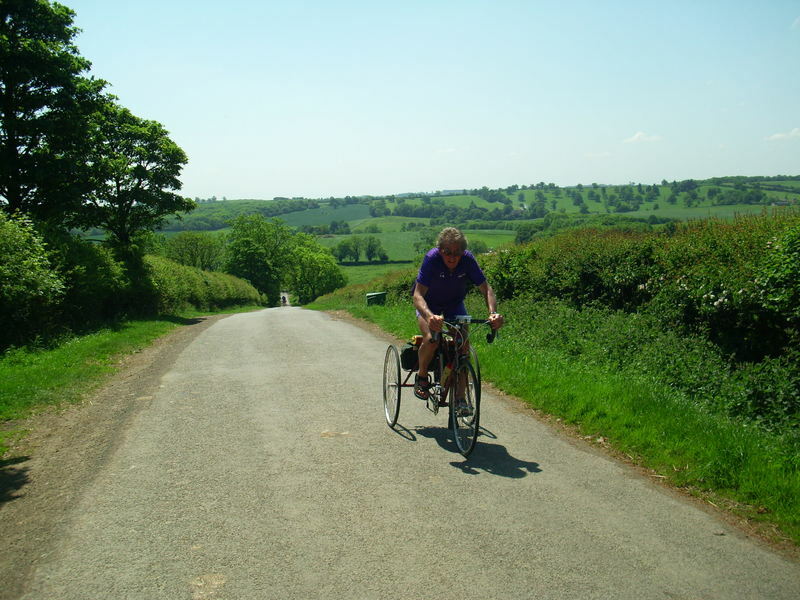 Harpole presented the first real road riding culminating in a heart thumping climb out of the village and onto the Roman road. 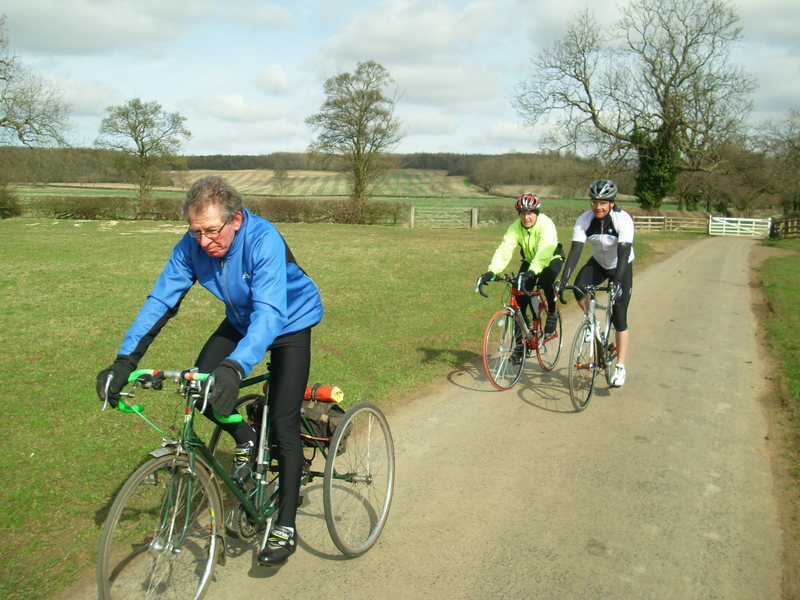 We levelled off for a while through Harlestone and the Firs before a combination of climbing and fast descending around Althorp. Heading towards Whilton we toyed with the idea of having an impromptu café stop at Whilton Locks just to warm us up in the difficult conditions but we decided to stick to the plan and head for Barby instead. The gated roads at Norton posed no problems and were traffic-free as we looked forward to the comfort of the cafe at The Willows. 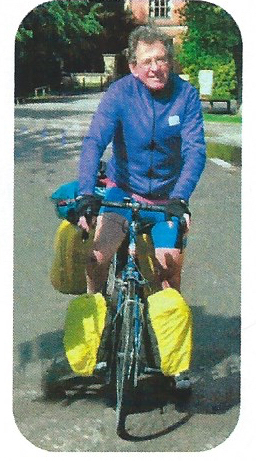 Once inside the options were given to carry on riding or return home. Phil L who had been struggling with the cold, sensibly decided to return home. Dave and I decided to continue on to Draycote. On leaving the cafe the sun came out lifting the mood of the group as did the “4 miles to Dunchurch” sign shortly after. Crossing the border into Warwickshire we were greeted with freshly laid tarmac which helped our progress towards the reservoir. At the A426 we used the designated cycle paths to keep us safe with hardly anybody else using them. The main road through Dunchurch seemed easy as was the last mile or two into Draycote Water using the busy A426. We were greeted with a busy reservoir and had to wait to be seated at the restaurant. So we opted for bracing balcony seating giving us a table straight away. 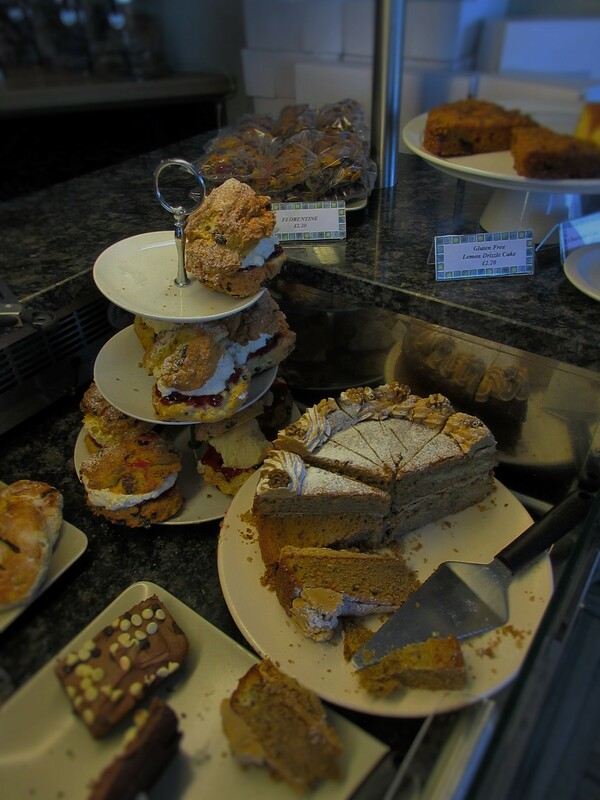 Hot soup and tea warmed us up as well as eating the biggest jam and cream scones we had ever seen. Ride. Eat cake. Sleep. Repeat. Suitably refuelled we retraced our steps back towards the town and the route back to Barby. On the way the inevitable happened. I hit a patch of ice and briefly slewed before righting myself again without falling. A close call. With the sun still shining the route back seemed better but it was still very cold and difficult to feel any benefit. We continued past Whilton Locks to the last real climb of the day to the top of the Roman road and we both climbed admirably. At Harpole Dave continued on to Duston whilst I followed the same route back over Pineham and Hunsbury Meadows, calling it a day there and cleverly avoiding the need to climb “Mount Tesco” back to the official start. This was a tough challenge today due to the cold conditions but we did superbly whatever our distance. 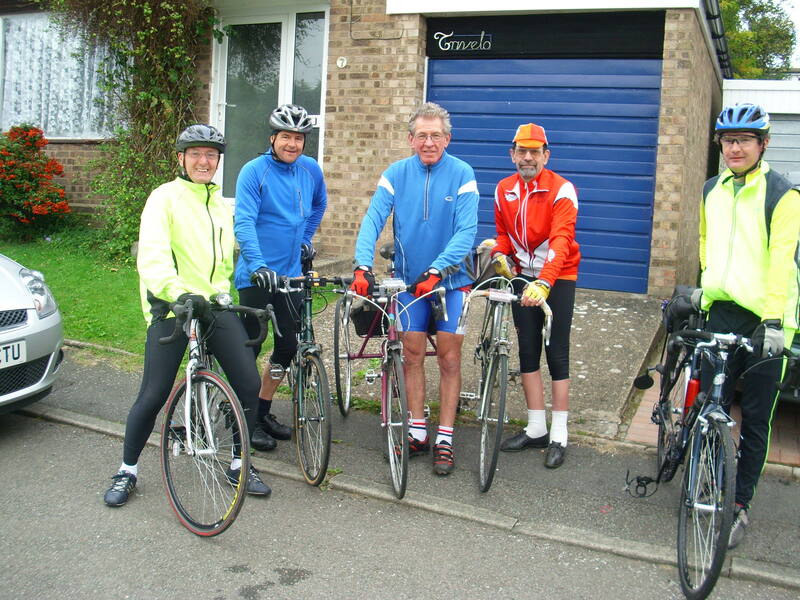 Six cyclists converged at the meeting point, Moulton Co-op, having all received their first soaking of the day (second if they had taken a shower before leaving home). 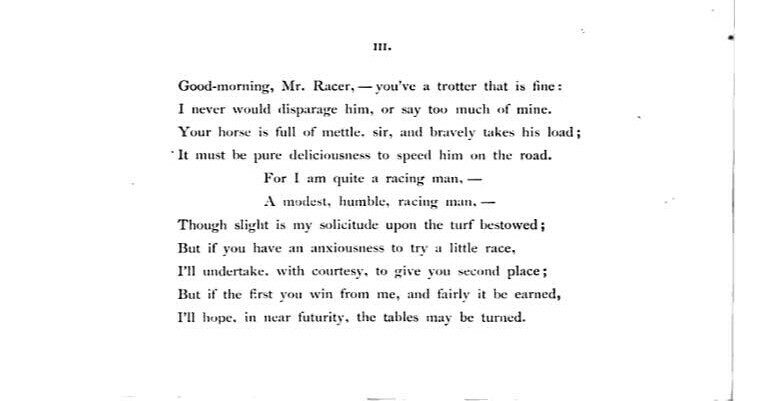 Not the greatest of starts to a leisure ride but everyone was in good spirits and looking forward to the “lumps” (as Milton described them) that lay ahead. Wind was another feature of this ride, the meteorological kind, that is. Scotland had taken a huge battering overnight. The Midlands faired better but it nevertheless proved challenging when passing holes in the hedge on the first section to Holcot. It was not long before we took a break, about three quarters of a mile actually, when Giles suffered a flat rear [tyre] which necessitated a delay to the half of the group who stayed to help. Quickly fixed and that ever present lesson “cheap tyre levers are a worthless investment” learned, we shot off in pursuit of our leader and the two Brians, one of whom was making his CTC ride debut. Hope we see you again soon, Brian! Turning west at Holcot it became apparent that the wind really was the dominant factor in the day’s weather. Having to pedal downhill always feels so wrong but today was necessary in order to maintain sufficient forward motion to stay upright. The climb up to Brixworth proved a real leg tester. In the village we rejoined Milton who had kindly waited, and coincidently found the time to down a coffee and a sausage roll. Chapeau! Across to Spratton and then Teeton where we rejoined the two Brians. The weather was slowly becoming brighter with spells of sunshine and the occasional rainbow. Turning south at Teeton the going whilst still lumpy became a little easier. It was not long before we arrived at the Stables Coffee Shop in Church Brampton where we were joined by John, who not fancying the ride had travelled by car. Why have I never thought of doing that? After refuelling we departed back towards Moulton via Pitsford, an easterly direction that ensured that we were wind assisted all the way back. It was pretty tough going for a leisure ride, but nevertheless thoroughly enjoyable. Thanks to Milton for planning and leading the ride! I am very sorry to post on here sad news of the death of Max Scott. 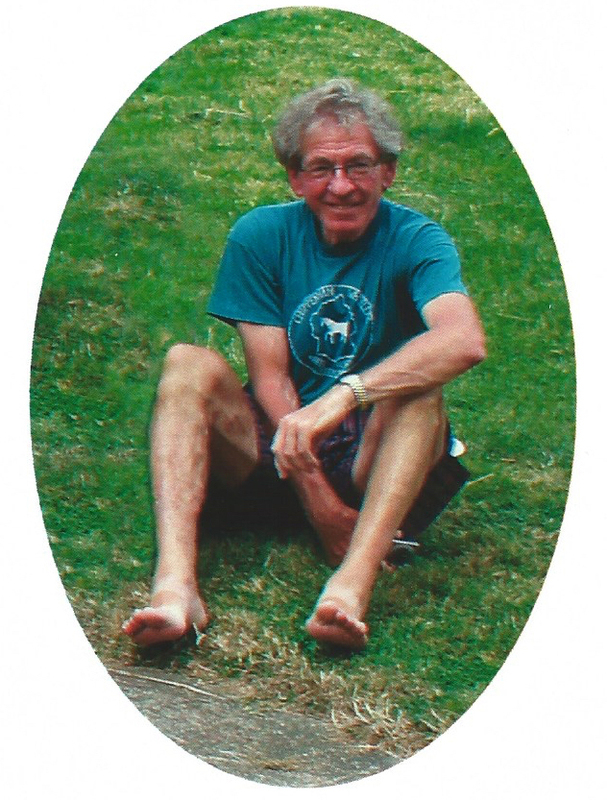 He died on Tuesday (6th January) in Cransley Hospice, Kettering, after an illness which he fought with patience and good humour. 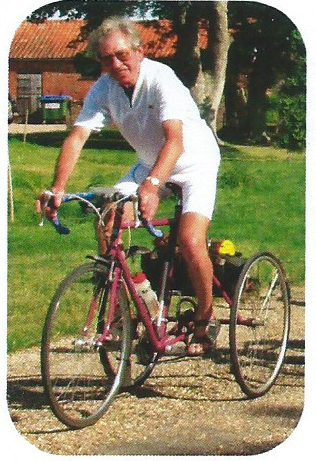 Max was a stalwart – the stalwart – of the Northamptonshire cycling scene. He was secretary of CTC Northamptonshire & Milton Keynes (formerly the Northants & North Bucks CTC District Association); he officiated at its final AGM just two months ago. 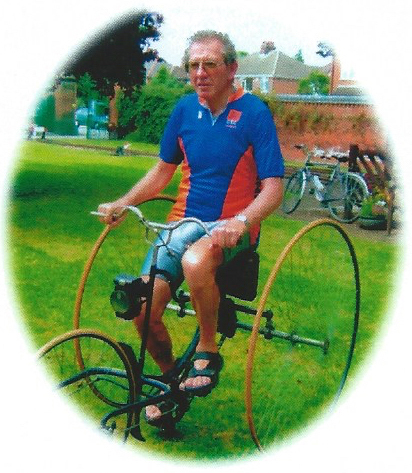 He organised Kettering CTC; he played a major rôle in the Northampton & District Cycling Association; he publicised the Thursday Club. And he did all those things over decades! Max took to “new media” with aplomb, setting up and maintaining Kettering CTC’s website with photos, videos and downloadable calendars. 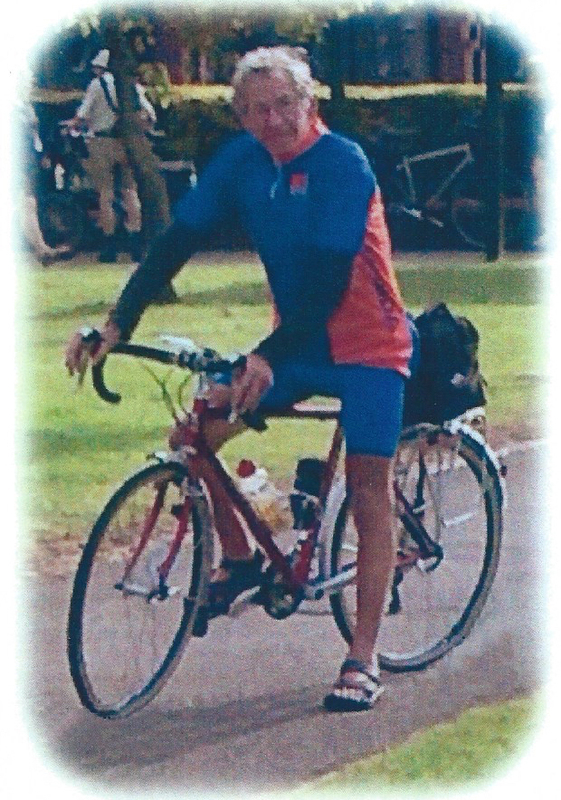 It was always a pleasure to receive one of his regular e-mails with details of rides and events. The tourist trials! The hilly 100ks! And he was a grand cycle tourist. He’d been bitten by that bug when he was a young teenager. His first adventure was to cycle with his sister from the family home near Ipswich in Suffolk to visit relatives in Kingston-upon-Thames. On the journey there and back the young Scotts stayed in youth hostels. 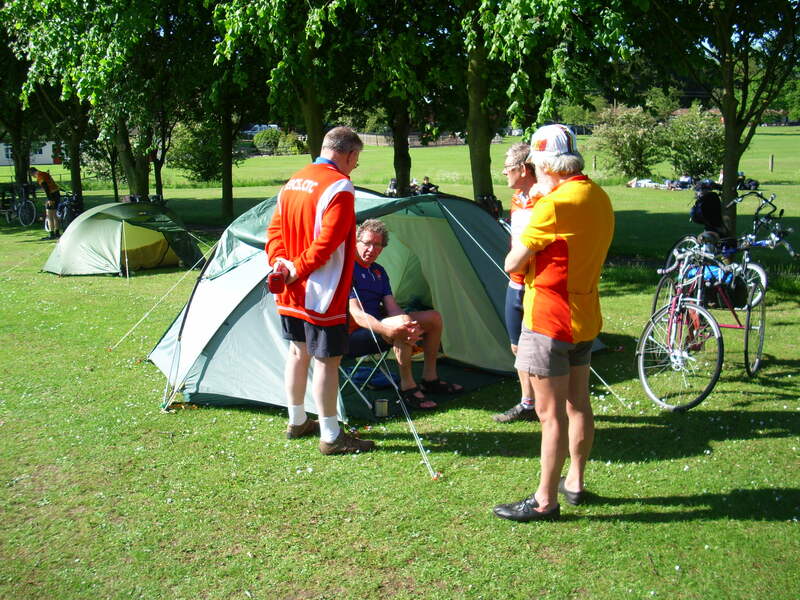 Cycling and youth-hosteling became the loves of his life. A Happy New Year to all cyclists everywhere! Those of you who follow me on Instagram may have noticed that I’ve been perusing old issues of The Wheelman and Good Roads. 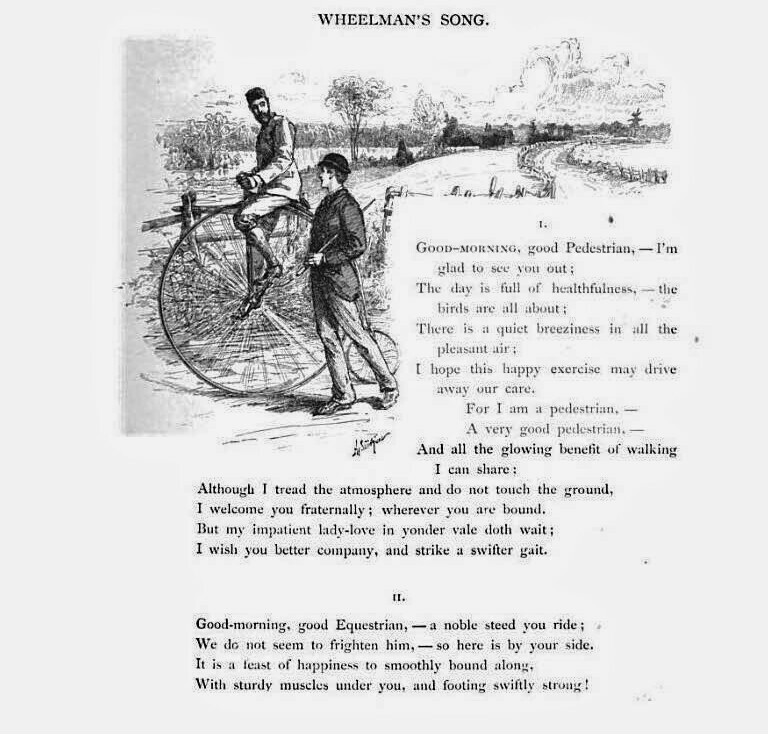 Both magazines were publications of the League of American Wheelman, which is now the Bike League, and date back to the late 1800’s, when people’s fascination with the bicycle was just beginning to take hold in the United States. 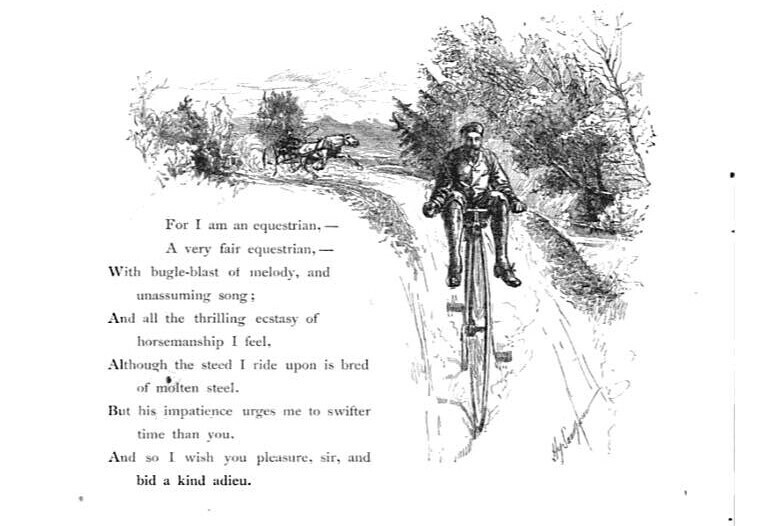 The excitement and novelty of riding a bicycle permeates these editions. 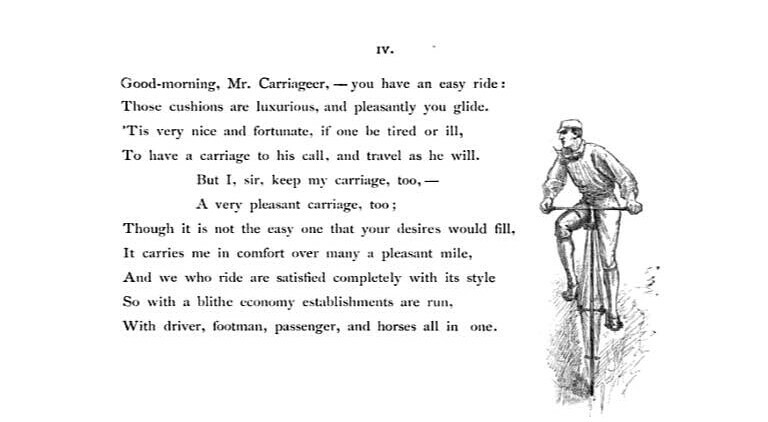 From tour recounts to illustrations and poems, men (mostly men, as women are unfortunately largely absent from these publications) unabashedly adored bike riding. 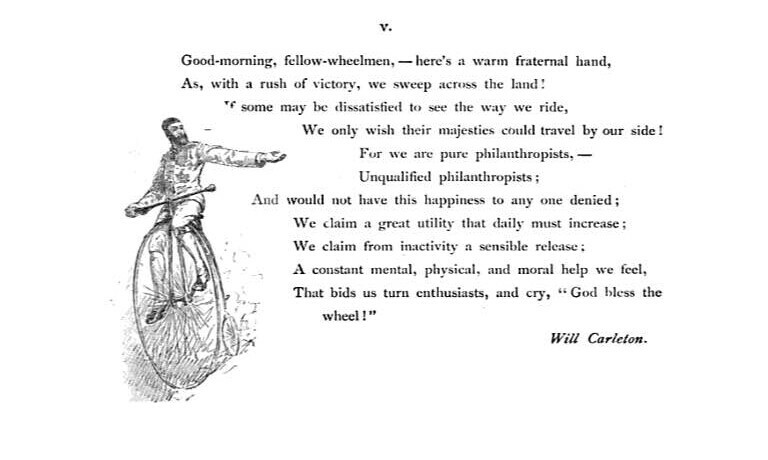 An example of this appreciation for the bike is found in the poem below, “Wheelman’s Song, ” written by Will Carleton in 1884. It seemed a fitting way to end one year and help inspire the next. Happy New Year. I hope it’s a great one for us enthusiasts.